A breakfast nook for everyday meals, or a more formal dining room to accommodate large family gatherings, your functional and aesthetic needs are met. Every family is different, but one thing in common is the desire to sit around a table and share food, thoughts, and memories together. The following images are examples of the many ways in which this can work. A kitchen nook that previously housed a banquette was redesigned and enlarged to incorporate a work space and new eating area. Existing windows were removed and larger ones installed to add more light. A large pendant light hangs over a custom made metal table creating an intimate, fun and functional area for the family to enjoy. A bright citron color present on the walls and accented in the upholstery adds energy to the space. Seating for ten was placed around this custom made dining table by Brueton, with a light panel inset in the center of the table. This is an informal eating area adjacent to the open plan kitchen. Existing chairs were reupholstered in an orange fabric to add warmth to the space. 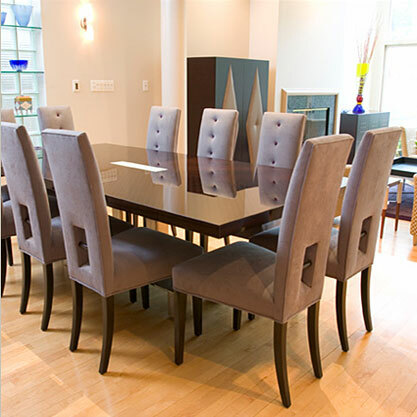 A formal dining room designed to accommodate twelve, which also needed to be family-friendly. Heavy duty upholstery that could be easily cleaned, but still look elegant, in a metallic finish and button detail complimented a custom-made table and console with silver-leaf detail.